While they pack a few solid pros, including a large screen (5.7 inches) that tries to rival the ones rocked by the best phablets, the 2018 Motorola Moto E5's technical specs nail it to the budget Android market notwithstanding. Leading its cons is a low-class (in terms of raw resolution) 5-megapixel selfie camera that likely struggles in comparison to the 8-megapixel front cams offered by several tantamount models, although Motorola does try to spice it up with a dedicated front-firing LED flash . It also does not feature the brand's water-repellent nano-coating , which we have come to expect out of middle-class and high-end Motorola Androids. 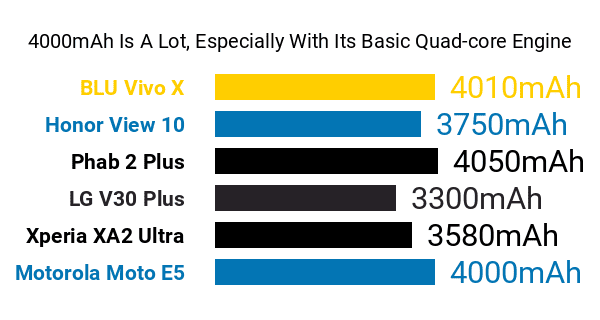 Its biggest selling point is the 4000mAh battery cell sitting under the hood (Don't forget to check out the best heavy-duty smartphones here), which is particularly promising, coming from a phone that lists a basic-level 1.4GHz quad-core processor and a middle-of-the-road 2GB RAM among its processing pros and cons, both of which shy of middle-class standards as of this on-paper review. In contrast, a good number of models with its kind of battery power use eight-core processors and often pass the 3GB RAM threshold. 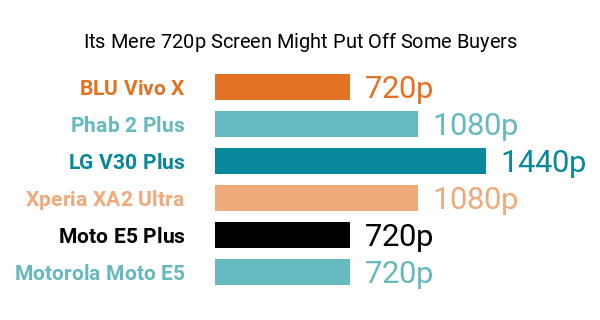 Up front, it sports a spacious 5.7-inch display with an 18:9 aspect ratio that only resembles those of higher-specked phablets in terms of overall screen real estate, seeing that it settles for a low-key 1440 x 720 HD+ resolution , instead of shooting for something like Full HD+ (1080p). Its native storage memory caps off at 16GB, with support for up to 128GB of extra storage joining in as well, which we consider passable, at least in this market segment. This 5th-generation Moto E model's pros and cons also include a 13-megapixel f/2.0 camera bedecked with phase-detection autofocus and an inbuilt video stabilization feature. It also comes with fingerprint recognition and NFC, though the latter is only offered by the single-SIM variant. The E5 is LTE-ready and it features a front-ported speaker. Additionally, it comes with Moto Actions -- Motorola's self-branded suite of gesture-based phone controls. Coated in either Fine Gold or Flash Gray, this Oreo-run Android seems to target budget-cautious users looking for a not-too-fancy large-screen, stamina-driven smartphone.